In the 1980s the West German Peace Movement -- fearing that the stationing of NATO nuclear missiles in Germany threatened an imminent nuclear war in Europe -- engaged in massive protests, including sustained civil disobedience in the form of sit-down demonstrations. 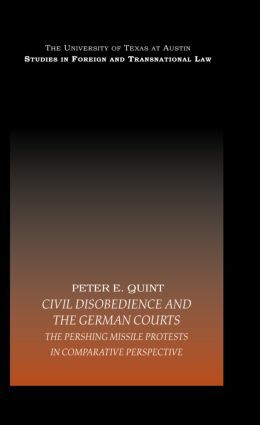 Civil Disobedience and the German Courts traces the historical and philosophical background of this movement and follows a group of demonstrators through their trials in the German criminal courts up to the German Constitutional Court -- in which their fate was determined in two important constitutional cases. In this context, the volume also analyzes the German Constitutional Court, as a crucial institution of government, in comparative perspective. The book is the first full-length English language treatment of these events and constitutional decisions, and it also places the decisions at an important turning-point in German constitutional history. Peter E. Quint is Jacob A. France Professor of Constitutional Law at the University of Maryland School of Law in Baltimore, U.S.A. His main research interests include American constitutional law and comparative constitutional law, particularly the constitutional law of the Federal Republic of Germany. He is the author of The Imperfect Union: Constitutional Structures of German Unification (Princeton University Press, 1997), as well as numerous articles on American and German constitutional law.